I started my beauty career as an Esthetician (beauty therapist specializing in skincare), instantly falling in love with the skin & how to get the best put of it. I was surrounded my the best professional products & treatments in the industry so I pretty much tried everything I could get my hands on, so I set out on a quest to find the best products, tips and tricks to really get the best out of your skin. I was recently asked by a client and inspired by Glossier, a beauty products company, what my go-to products are that help you enhance your natural beauty without using heavy makeup & it got me thinking back to my days as Esthetician where is was all about removing the makeup and concentrating on the skin. So armed with all my knowledge I have put together my favorite products (light makeup & skincare) to enhance & bring out the natural beauty of your skin. Cleaning oils – not only do cleaning oils feel amazing on your skin, they allow you to cleanse deeper, removing more impurities & makeup without stripping the skin. My fav go to oils are the Shu Uemura High performance cleaning oils. With 8 different oils to choose from you will be sure to find the perfect match for you skin. I love the sublime beauty cleansing oil – it’s a kit staple for me. Designed for sensitive skins makes it ideal to use on all skin types. It’s perfect to use before a beauty shoot or as part of your daily routine to get the skin really clean & hydrated. Spend a few Minutes massaging it in and then rinse off, leaving skin refined, soft, smooth, and plump – skin heaven! Facial balms – Another heavenly way to cleanse your face is with a balm, balms much like oils clean into the deeper layers of your skin, again without stripping the skins natural defences. Soap based cleansers (anything that foams) can remove the natural oils of your skin leaving it sensitive, dehydrated & prone to breakouts. I love to use my cleansing balms in the evening when I have a little more time, if I was wearing a lot of makeup that day I would wipe over my skin with ‘Bioderma’ first to remove the bulk of my makeup and then deep clean with my balm. My Ultimate indulgent balm is the Thermal Cleansing Balm by Omorovicza – it Decongests clogged pores & removes every last trace of makeup. Sweet Almond Oil ensures it soothes & nourishes your skin too, leaving it soft & silky. Facial mists – Toners are so last season! After cleansing, spritz your skin with a hydrating mist, these beauties instantly cool your skin hydrating the surface and prepare your skin for your moisturiser. – I love ones infused with essential oils which help alter your mood, look for essentials oils such as lavender & rosewood for a calming spritz, and citrus based mists for an instant pick me up! Dermalogica do a mini mist perfect for travelling, especially on planes where your skin gets so dehydrated, they are an instant skin pick me up! Perfect to use when travelling especially on planes where the moisture gets sucked right out of your skin. Face Masks – Nothing gives your skin more of an instant ‘pick me up’ than a good facial mask, especially if you exfoliate first. 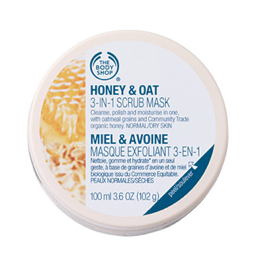 I love the Body Shop’s Honey & Oat scrub & mask, spend a minute massaging the scrub over your skin to slough off dead skin cells, then leave for a further 5 minutes to hydrate the skin. Radiance boosters – I love a super shiny dewy skin, a dewy skin is a modern skin, and we associate healthy skin with skin that glows. So skip the foundation at the weekend and just use a radiance booster on your skin. What is a radiance booster? I hear you say (might have just made up the term) I consider anything that has a light reflecting/ pearlescent /iridescent base to be a radiance booster. So the classics are the Becca ‘skin perfecting primers’ – various shades for different skin tones – LOVE these. Another fav of mine is the Dior Skin Maximizer – use either alone, or if you feel like you just can’t leave the house without foundation then add a drop of foundation to the base to create your own tinted radiance booster (I so need to trade mark that) – Que. yummy radient skin! Tinted moisturizers I’ve never been a fan of heavy foundations, even of you have problem skin & need a little more help, it’s best to use a lighter base and use a separate concealer applied with a small brush where necessary. Tinted moisturizers allow your natural tones, hues & freckles to shine through allowing for a more natural fresh finish. Perfect for summer, my go to tinted moisturizers are the Sheer Tint (spf 20) by Dermalogica great for all skin types & the Pure Finish Mineral Tinted moisturizer by Elizabeth Arden – which is jammed packed full of vitamins and moisture boosting ingredients. My final favorite natural beauty enhancer is a lip & cheek tint. It would be wonderful to wake up with naturally flushed cheeks & just bitten lips – but unless your snow white that’s just not going to happen. We are lucky these days that most cosmetic companies have a variation of a lip/cheek stain. You generally need to work quite fast when applying your stain, liquid stains like ‘Benetint’ can dry very quickly & if not blended can leave you looking more Aunt Sally than glowing goddess! I advise using a beauty blender to apply rather that the brush applicator that comes with it. Solid or gel like stains are more easy to handle – Josie Maran has nailed the stain! Try her Argan Infinity Lip and Cheek Creamy Oil – which has a cream to oil formula Infused with her signature 100% Argan oil, it has a super creamy texture which melts onto the lips and cheeks leaving a beautiful flushed appearance – heaven on the lips, comes in 6 shades to suit every skin type.